This vintage Style 159 Military Band Organ, manufactured by the North Tonawanda Musical Instrument Works in 1910, was recently acquired by Historical Society member, Carl Hoover, and brought “home” to the city of its origin. The instrument, with 46 keys, bass, and snare drum and cymbal, uses a paper role. The hardwood case is nicely carved and scrolled and the front is finished in a light cream enamel, decorated in gold and various colors. The sides and back are finished the their original walnut stain. 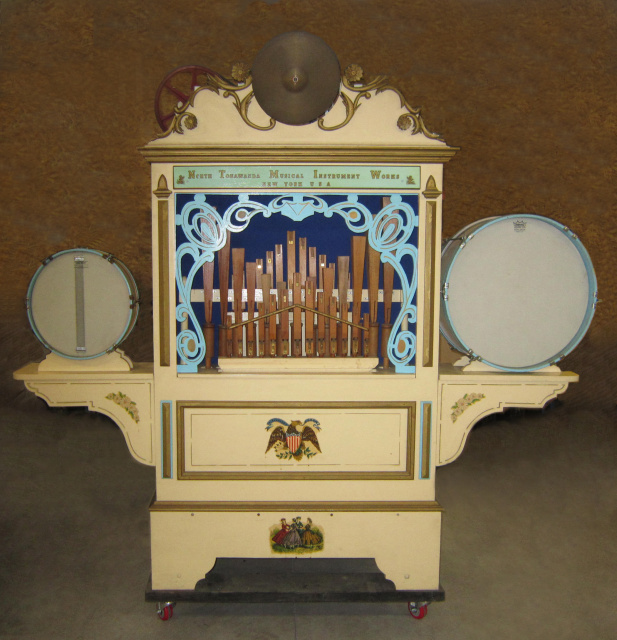 The story of Carl’s quest to bring this classic example of a Military Band Organ back to North Tonawanda is the subject of a feature article in the September issue of THE LUMBER SHOVER, newsletter of the Historical Society of the Tonawandas. The organ is privately owned by Mr. Hoover.